Color Toner Expert, online at colortonerexpert.com, offers a wide selection of quality ink and toner compatible with many printer brands. Color Toner Expert has compatible inks and toners for brands like Brother, Canon, HP, Epson, Kodak, Samsung, Sharp, Xerox, Panasonic, and others. Color Toner Expert carries remanufactured products and offers discount to help customers save on their office and home office supplies. Color Toner Expert guarantees their ink and toner perform at the same standard as the original brands. But before you shop, get all the latest colortonerexpert.com discounts, Color Toner Expert promotions, and Color Toner Expert coupon codes found here at RetailSteal.com. Color Toner Expert ships within the United States, including HI and AK, and offers shipping to APO/FPO addresses. Color Toner Expert ships via USPS and UPS. See site for more information. Use coupon at Color Toner Expert and save 15% on ink and toner purchases $300+. 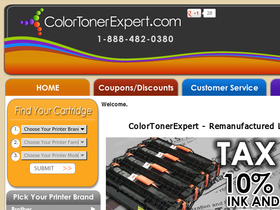 Save 12% on your purchase from Color Toner Expert when using this coupon code. Click here to save on ink and toner compatible with HP, Lexmark, Dell, Epson, and other printer brands. Use coupon code and save $10 on your Color Toner Expert purchase $50 or more. Enjoy a 5% discount on ink and toner from Color Toner Expert. Use code on purchases $50+ to qualify. Shop at Color Toner Expert and enjoy free shipping with purchase $100+. Save up to 85% on remanufactured toner from Color Toner Expert. Click here to shop and save on toner compatible with Brother, HP, Canon, and more. Enjoy savings Color Toner Expert when you buy more. Buy 3 or more of select inks and toners to enjoy discount.